One of my best friends died today. It is not the first time in my life that someone important to me has died. But for some reason, the news of the death of my friend Jane Estelle Tromblay is affecting me very deeply. Jane and I were lovers for a long time. We shared the healthiest, most empowering, fulfilling, fun, and most loving relationship of my life. It ended when I moved to Ottawa in 2009, in pursuit of a job opportunity (which turned out not to be real). She eventually married another man, and shortly after their wedding she was diagnosed with cancer. It occurred to me this year, not long after she told me about her cancer, that I was pulled away so that her husband could arrive – he is a medical professional with the Canadian Forces and therefore much better able to care for her than I could have been. I am sure he is feeling the loss much worse than I am. But Jane and I remained close and saw each other as often as we could. When she died, she was at home, with people who loved her nearby. I think some part of her soul was telling me how I should think of her now that she is dead. And, I think some part of Herself was telling me a home truth about what really matters. Friends, go right now to the people you love and tell them you love them. Don’t wait until you are home from work. Get on the phone, get in your car, or board a bus or a train or whatever it takes. Don’t wait until the person you love most is buried and gone. That could happen as soon as tomorrow. So go and tell your friends and lovers what wonderful people they are, and do some work of generosity for them. Do it today. Do it now. 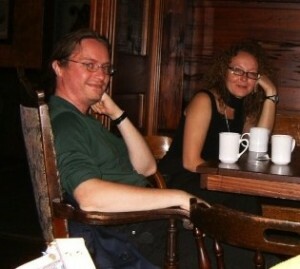 Photo: Myself and Jane at the Hamilton PPD after-party, 2008. This entry was posted in General and tagged death, life. Bookmark the permalink. 4 Responses to One of my best friends died today. Brendan, I’m so deeply sorry to hear about the loss of such a close friend. I can’t begin to imagine how you are grieving now. I often find myself telling people who are feeling alone that they are loved. It’s a very distant thing to say. The truth is I love you, my family loves you, your friends love you, and Jane loved you, every bit as much as you are loving her right now. This is the world I’m happy to live in, because it is filled with such deep and abiding love. Knowing that won’t heal the terrible wound in your heart right now, but at least it will honour her words and prove her right. Our world is beautiful and amazing because of the friendships like the one you describe. I wish I could take your hurt and grief and soothe it with some magical balm. But I think your grief does Jane honour. I’m glad that you had each other in your world. Brendan, my brother, you are wonderful and I love you. It’s an intense reminder. I’m sorry for your loss, and also appreciating that you’re able to take wisdom from it, and willing to speak about it. I have experienced feelings like this before. Truth becomes ever so clear especially with regard to what really matters in our lives, when we’ve been brushed by death’s wing. I have felt thankful for that before, though no one could expect you to feel thankful for that reminder now. I like to think that the dead are still here filling and ensouling the world, that their life force is released back into the same earth, the same sky that holds us. That doesn’t fill the hole in our lives, but it is at least more intimate than the idea that they’re gone away somewhere distant, or have ceased to exist. And I think it makes more sense, anyway. Your Jane had the right of it.